Did you take part? We take access to ice and clean water for granted here in the west. Many African children have to walk several kms each day to fetch water and then find firewood so they can boil it and make it safe to drink. This is all before they can even think about going to school. Thanks to your support most children living near to Uganda Lodge in Ruhanga now have taps producing clean water near their homes. As well as clean water – GOOD SANITATION helps to prevent the spread of disease – and we need to build a toilet block at our proposed Vocational training Centre before we can admit any students, especially the girls. Thanks to a sizable donation from Hastoe Housing we have already built two workshop style classrooms, so funding for building toilet/shower blocks is urgent. Ida Horner & our supporting Charity “Let Then Help Themselves out of Poverty” is holding a fundraising event with an African Theme at Walton-on-Thames, Surrey on Saturday 18th October Tickets at £20 pp (including food and a live band) are available from myself or here. Before Denis can open the proposed vocational training workshops for the young people of Ruhanga, a toilet and shower block must be built. All proceeds from the evening will go towards getting this building work started. 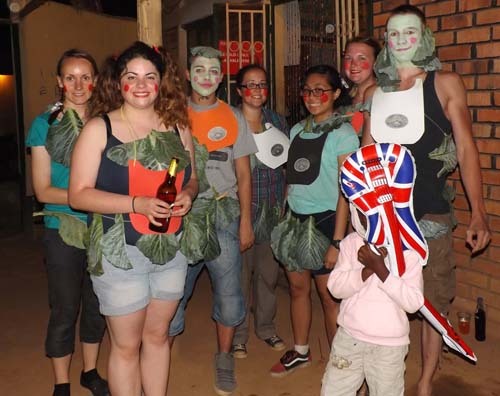 The venue is only five mins walk from Walton-on-Thames station and the last train back to London is well after midnight.How about making it a REUNION with some of the friends you made out in Uganda and meet up with them again while at the same time supporting Denis’s projects in Ruhanga? I can offer an overnight stay at my home in nearby Shepperton, or you could make a night of it in London before returning home. If you cannot attend the event, please consider making a direct donation for the Vocational Training centre as shown here. The first two classrooms for the vocational skills training (bicycle repair plus sewing and tailoring) will be in full use at the start of the new school year assuming we get the toilet/shower block built. We hope to start the foundations of the proposed coffee shop shortly. This is a particularly important unit because it will provide an income as well as skills training. Please support this initiative through my fundraising page on BTDonate. If you have any contacts in the catering trade who may be able to offer financial assistance or sponsorship, we would be happy for their name to be prominently displayed on our website and in the building. 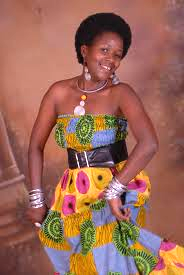 They may also wish to use this support to promote their social awareness ethic to their customers. The last term of the school year started recently so Rosie, Jordan and Leticia were busy helping the teachers register the children again. 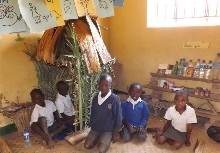 There are still over 100 children waiting for sponsorship and to keep a child at our school for a month costs less than a pint of beer in the local pub. Now the rainy season has begun Denis has been able to make a start on levelling and re-grassing the sports fields at the school. Thanks to funding from UCL Academy in London he has employed local women to plant the grass and this gives them a little extra to support their families. I’m hoping to see the results of this soon as I return to Ruhanga in 3 weeks time. 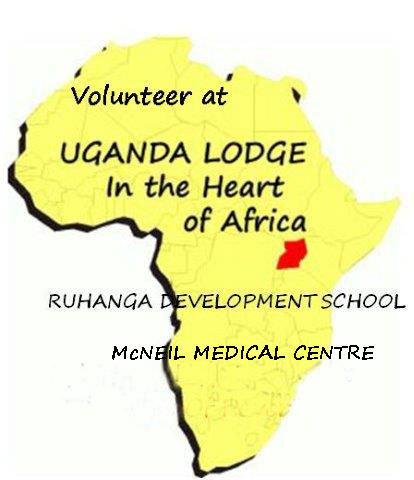 For those planning to volunteer in Uganda soon the rainy season generally means hot sun in the morning and hour or two of thunderstorms then more sun! We have started regular dental clinics at the medical centre thanks to help from volunteers from Dentaid. More than 1,000 children in Ruhanga have had dental screening, and Health and Dental education in the village is still ongoing. 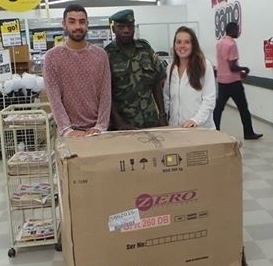 We have applied to become an official centre to provide free childhood vaccinations, and ongoing fundraising at the lodge has enabled us to buy a new freezer to store vaccinations. A a big thank you to Denis, Jordan and Rose for organising this and to everyone who supported them. 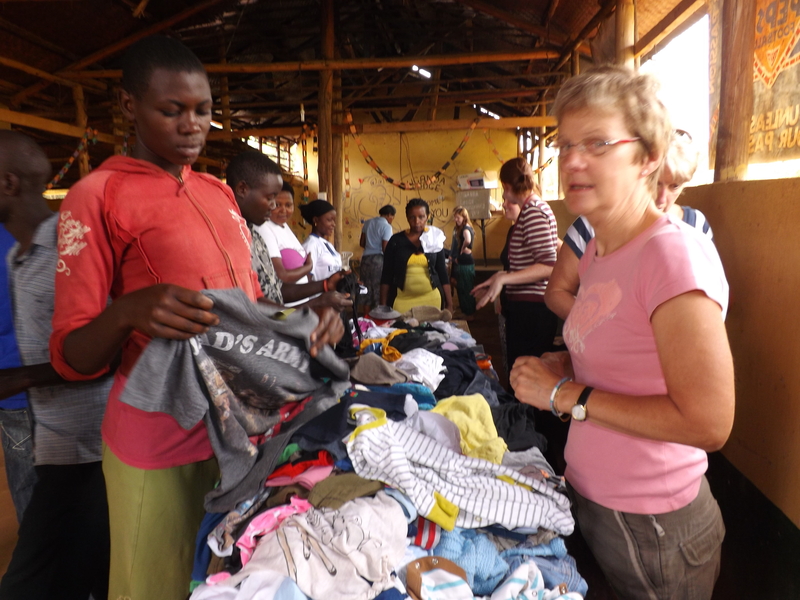 All the work Denis does for the community around Uganda Lodge is not possible without your support and fundraising. Thanks to all the volunteers who have put up an online fundraising page on BTDonate or Virgin Giving as this generates considerable funds for Denis. For those of you who have not done so please consider this as a way to continue to help Ruhanga. Alternatively, you could organise a fundraising evening or event with your friends such as a race evening, a pamper party or a swish clothes swap evening. 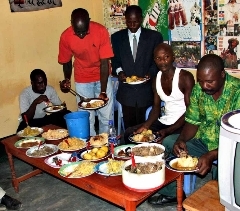 You can be sure that 100% of the money raised will go directly to infrastructure in Ruhanga as none of us take any salaries or expenses . It is also a good opportunity for you to show off some of the many photos you must have taken. Or – support our event 18th Oct and you can share your photos and meet up with old friends. 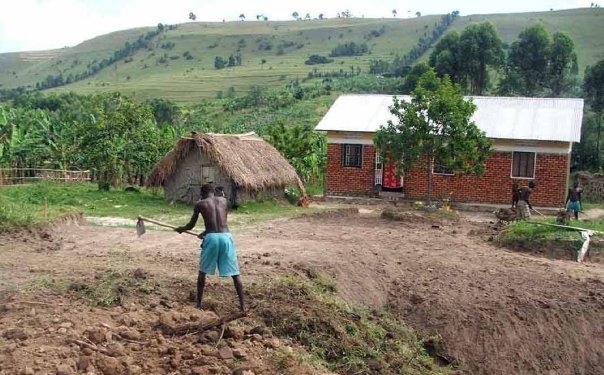 Lets all help Denis to get his planned vocational training centre up and running so the youth of Ruhanga can gain some skills that will be useful all their lives. PLEASE CONTINUE TO SUPPORT DENIS IN THIS WORK. 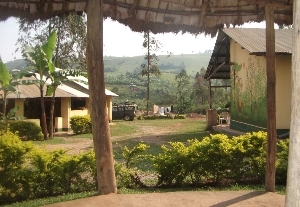 Its not difficult – please email me to discuss what you could do if you cannot get to meet up on 18th Oct. Can you imagine how much behind the scenes effort over the past 9 years has gone into providing the facilities that Ruhanga now has? This single house on the left set amongst the Ruhanga bushland has grown to a massive complex that now houses up to 50 volunteers, plus provides clean water to several villages, a medical centre and a Nursery & Primary School and overall employs approx 50 local people full-time as well as dozens of ad-hoc buildfres, labourers and other tradespeople. The busy summer season at Uganda Lodge passed successfully and this is largely due to the long term help received from Jordan and Rosie. Rosie has now returned home for a well-earned rest and Jordan will be leaving soon. 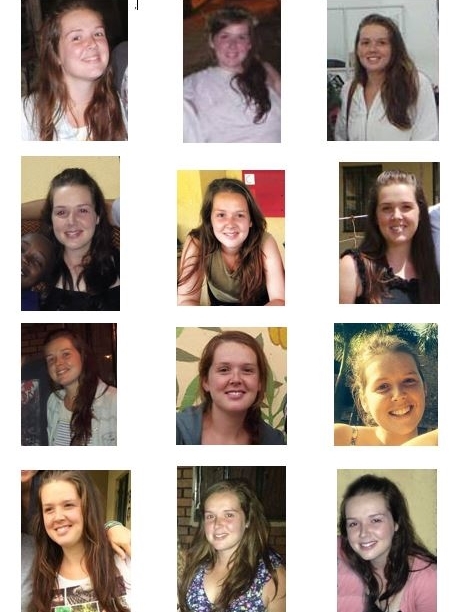 Here is a collage of volunteers different snaps of Rosie and we hope they will both be returning in 2015. I always look forward to receiving your feedback and we try to address anything negative as well as build on the positive. I have just found a website where you could receive a $1,000 travel voucher for a few minutes work. I am going to add our details so you can enter; please send me links to your photo albums and any online blogs that you have written.